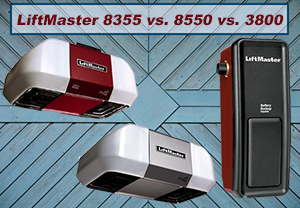 What’s the best garage door opener in the LiftMaster 8355 vs. 8550 vs. 3800 debate? This is a burning question that most garage owners ask when looking for a garage automation device. You will agree with me that in as much as the three are from the same brand, their differences are profound. That said, you want to make a clear distinction between the models so that you may make the perfect purchase decision. So, if you are not sure which model is best for you, this comparison review will be very resourceful. 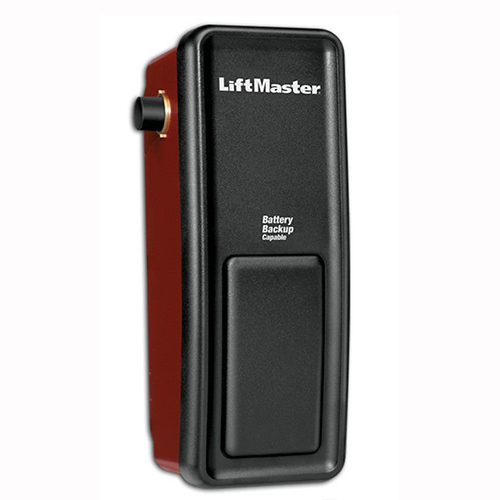 The LiftMaster 3800 was an excellent jackshaft garage door opener that was discontinued and replaced by the new LiftMaster 8500. Though you may find it listed on many websites, when you buy it, the new version is delivered.The new version is pretty awesome, and the most notable feature is the new MyQ technology that facilitates remote Smartphone operation. As a wall mounted opener, the 8500 is ideal for homeowners with very high or very low ceilings. Also, if you have cathedral ceilings and top wall tracks, this is your match. The LiftMaster 8500 is installed on either side of the wall and works by turning the torsion springs to open and close the garage door. The advantage of this garage door opener is that it reduces the vibrations on the ceiling which don’t only bring disturbance but weaken the ceiling. But then, it requires higher maintenance and works well only when it is in top condition. The first garage door opener is the LiftMaster 8550, a solid garage door opener from the Premium Series that blends efficiency and durability. It comes with the revolutionary P3 motor that is 75% efficient and quieter than your average engines. On the other hand, the Motor Vibration Isolation System (MVIS®) will reduce vibrations so it will not take a toll on your ceiling’s strength. Perhaps the best thing about this product is the battery backup. If you live in areas with frequent power outages, this is the real deal. I also liked the Timer-to-Close feature. You can set closing time, and it will automatically close your garage. This is the perfect garage door opener for those with single garage doors. It will also fit any garage owner who wants an energy efficient garage door opener. It boasts a 0.5 HP P3 AC motor that delivers outstanding performance. The smaller motor means it will produce lesser noise. In addition to this, the engine has an exclusive technology that reduces vibrations. This is called Motor Vibration Isolation System (MVIS®). So, if your ceiling is not that strong or you want less disturbance in the upper room, buy the LiftMaster 8355. Unfortunately, it doesn’t support battery backup like LiftMaster 8500 and 8550. But I’m glad it comes with all the other standard LiftMaster features. What’s the difference between Chamberlain and Liftmaster by Chamberlain? I know it can be confusing now that we have LiftMaster by Chamberlain garage door openers and Chamberlain garage door openers. If you shop around, you will also realize that these are entirely different products. Chamberlain and LiftMaster are both Chamberlain Group brands together with the likes of Craftsman, Merlin, and Grifco. So, while LiftMaster dominates the category of garage door openers for professional installers, Chamberlain deals with DIY garage door openers. That’s the main difference, and of course, they are entirely different in design and features. Like stated above, Chamberlain garage door openers are DIY meaning you don’t need a professional installer. On the other hand, LiftMaster offers garage door openers that require professional installation. Another notable difference is the build quality. 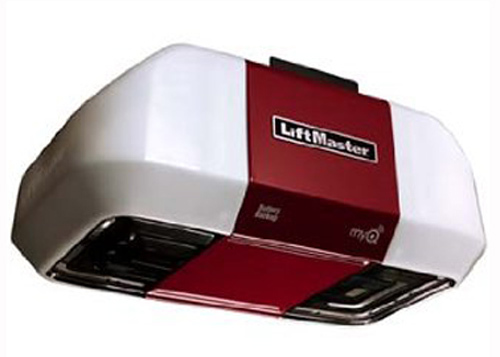 Chamberlain garage door openers are light duty while LiftMaster is heavy duty. The rails, for example, are very light for Chamberlain models while LiftMaster has robust and heavy duty rails. But the most important thing to note is the recommended size for each garage door opener. Chamberlain is ideal for garage doors up to 7ft high. Anything higher than that won’t work with Chamberlain garage door openers. Also note, Chamberlain uses a 3-piece rail system whereas LiftMaster has a 1-piece T-rail assembly trolley system. So, what’s the best brand between Chamberlain and LiftMaster? I have been asked this question. The truth of the matter is that the two brands are incomparable as they cater for entirely different categories. But one thing I will tell you is that their quality is the same as one company manufactures them. So, if you are looking for the best brands, LiftMaster and Chamberlain are industry leaders in the professional and DIY categories respectively. So, having introduced the three models, it’s time we get to the central business. In this segment, we will compare the LiftMaster garage door openers and see which one is the best purchase. A good approach is to discuss them based on the critical factors considered when buying garage door openers. When shopping for a LiftMaster, it would be a wise idea to identify each model from its design and aesthetics. So, how do these LiftMaster garage door openers compare as far as design and aesthetics are concerned? LiftMaster 8355 and 8550 take the shape of a TV projector. On the other hand, the jackshaft drive models sport a tower design, like a tower desktop, but not as thick. To further differentiate them, LiftMaster 8550 has some red accent while 8355 retains the traditional white, black and silver finish. The drive type is the most important aspect when buying a garage door opener. It refers to the mechanism through which the door is opened and closed. It is also the basis of the categorization of garage door openers. So, how do the three garage door openers compare here? The LiftMaster 8355 and 8550 come with a belt drive system. This is a mechanism that uses a belt instead of a chain to open and close the garage door. On the other hand, LiftMaster 8500 and 3800 come with a jackshaft drive system. The system uses pulley systems and cables to turn the torsion bars. Here, the head is installed on the wall next to the door. LiftMaster also includes a deadbolt in the jackshaft model for more security. So, what’s the best drive system between belt drive and jackshaft? To be honest, there is no clear winner here. You will choose a drive system depending on several other factors. But in general, belt drive systems are the best because they require less maintenance than a jackshaft drive. To be honest with you, I have never installed a garage door opener myself, including the one I bought in my new home recently. I am an average handy guy, but then I didn’t want to mess with the system; it costs a fortune. What I will advise you here is to seek professional help. A garage door can turn out to be very dangerous, so you want the opener to be installed correctly. But one thing you have to mind is the installation area. Do you have a bedroom above the garage? How high is your ceiling? These are some of the installation questions that you need to ask yourself before buying a garage door opener. If you have a low ceiling, you want to get a jackshaft opener, and that’s LiftMaster 8500. The advantage of this opener is that it is mounted on either side of the wall. So, whether your kids’ bedroom is above the garage or the ceiling is low, you can still automate your garage door. But if yours is a standard ceiling with enough room, get a belt drive opener as it can be mounted on the ceiling pretty well. The advantage of these openers as earlier said is their low maintenance requirements. This is an area where these three garage door openers differ. But still, you wouldn’t notice the difference so much if you are using standard residential garage doors. But for heavier garage doors, you might want to be keen on the motor and power. LiftMaster 8355 packs a 0.5 HP P3 AC motor that is super-efficient. At least with this model, my energy bills were not as high as with the other two. But then, I wouldn’t recommend this if you intend to use heavy doors. But if you are looking for quiet operation, then you can go ahead and purchase the 8355. When it comes to LiftMaster 8550, a larger motor has been brought on board; a 0.75 HP DC motor. One unique feature it brings on board is the slow start and stop that reduces the often louder noise when the torsions start moving and when about to stop. Lastly, LiftMaster 8500 also features a 0.75 HP motor but then remember this is a jackshaft drive model. When it comes to motor and power, the war is waged between AC vs. DC motors. In the past, AC motors were the favorites, but with the coming of DC motors, you shouldn’t buy AC garage door openers for these reasons. First, DC motors are more powerful than AC motors, and that’s why the LiftMaster 8550 is recommended for heavy doors. These motors are also quieter and offer smooth operation as well as starting. That said, I would go for the 0.75 HP DC motor, so the LiftMaster 8550 is a favorite here. But again, it would be a waste of power to buy such a heavy-duty garage door opener if you have a small garage door. So still, you can consider the LiftMaster 8355. Garage door openers work when plugged into the mains. This means that if there is a blackout and you don’t have a backup generator in your home, you might miss an appointment because you can’t open your garage. Neither can you close it until the power returns. But fortunately, Chamberlain has designed an impressive battery backup that works on some models only. If you want a garage door opener that has battery backup, you are spoilt for choice. You can choose a belt drive model, the LiftMaster 8550 or the jackshaft model, LiftMaster 8500. But then, it is imperative to note that you have to buy the battery backup separately. A lot of customers end up ranting that their package came without a battery pack up. As an automation device, you must be asking yourself how LiftMaster can connect with other devices. The magic is all in MyQ Technology that uses 900 MHz bands to communicate with the remote and other devices. 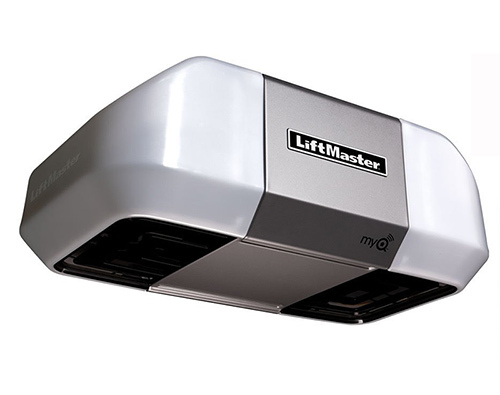 All the three models have MyQ Technology, so if you want a Smart garage door opener, you have one in these LiftMasters. But signal interference is a problem, but this is something you should expect in a less than 1 GHz band device – at least 2.4 GHz would have been much better. You will need to buy an Internet Gateway separately to get the most out of MyQ Technology. As its name suggests, it is the real gateway to a Smart life. Each LiftMaster model has a compatible internet gateway so be sure to pick the right model. LiftMaster 8355 uses 882LM while the LiftMaster 8550 and LiftMaster 8500 use 828LM and 888LM respectively. For Apple owners, you have not been left out as the three garage door openers also support HomeLink. Besides opening and closing the garage door, what else can a garage door opener do? One thing I like is their security and most importantly, safety. You want to keep your garage secure and your family safe so what features do these three LiftMaster openers offer? I like LiftMaster because of the security and safety features the garage door openers come with. Here are the standard security features that LiftMaster garage door openers come with. The first feature I want to talk about is Security+ 2.0TM. This is the primary security feature and ensures 3rd parties decipher no codes. With the recent wave of hacking, a preset code can be hijacked so this feature sends a new PIN every time you click the remote. Another great feature is PosiLock which is a superb feature that electronically locks your door. Here, there is something that I want to clarify. Most websites are describing this feature as hardware that is burglar proof. The truth of the matter is that this is just a digital; lock that will notice any signs of breaking in and notify the owner. For your safety around the garage door, there are a couple of features. First, there are visual and audio warnings when the garage door is closing. This notifies all people around to stay away from the door’s path. But still, children are a menace; they might ignore these warnings. But Chamberlain still has a technology that sends an infrared beam along its path. In the event something blocks the beam, it stops. Besides this, there is an Alert-2-Close feature that will send you newly generated access code when the garage door is closing. Chamberlain was very thoughtful to include a lighting system in their garage door openers. LiftMasters come with 100W CFL lighting kits, but some models come with extra kits. The LiftMaster 8355 and LiftMaster 8550 come with two 100W CFL lighting bulbs while LigtMaster 8500 and 3800 have only one. But the most exciting thing about them is the motion sensors. You don’t have to put them on when you get in; they will do so automatically when they detect motion. This is one area most customers go wrong, and I was also a victim once. Please make sure you are buying the head and all the necessary accessories. In short, you should know what accessories will come with your purchase. If there is a desired accessory missing, make sure to buy it. So, what accessories will your LiftMaster come with and what will you be required to purchase? Ordinarily, your LiftMaster will come with the head unit, control panel, one button remote control, and the Protector System. However, several other compatible devices can be bought separately. These include; extra button remotes, Wireless Key entry, laser garage parking assist, MyQ Home Bridge, among others. I’m sure you understand the essence of a warranty on any purchase. You don’t want to incur the repair or replacement costs that are associated with manufacturer’s defects. So, what type of warranty does Chamberlain LiftMaster offer with these three garage door openers? LiftMaster 8355 comes with Lifetime Warranty on the belt and motor and one year warranty on parts. The jackshaft models have a different warranty scheme; Lifetime Warranty on the engine and five years on parts. But then, the most important thing for a garage door opener is to read and understand the Terms and Conditions in full. A lot of people often complain that their warranty was not honored yet they breached the terms unknowingly. LiftMaster garage door openers come with only one remote included. This means you will have to buy another remote, maybe for your wife or have an extra remote for an emergency. But then, you will find very many versions of LiftMaster remotes in the market. So, the big question is, will any LiftMaster remote work with your LiftMaster garage door opener? Compatibility should be a significant consideration when buying LiftMaster remote controls. You will find that old models have old models don’t support the latest security features. That said, you want to buy a compatible remote control. But how do you choose a compatible LiftMaster garage door remote? The table below will help you select the right remote for your LiftMaster garage door opener. Use the color codes to identify the remote version require. The 1997 – 2005 remote is compatible with Security + and use the orange or amber color code and light. These are the models that it can work with; 894LT, 892LT, 971LM, 877 MAX, 893 MAX and 890 MAX. 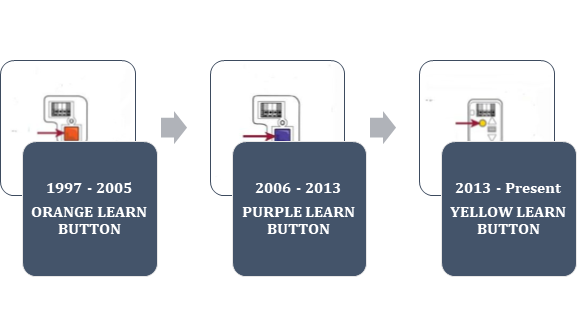 From 2006 – 2013, we had new models that used a purple color code and was compatible with Security + also. Now, we have the latest Security 2.0+ that is available is select remotes; 891LM, 890MAX, 892LT, 893LM, 811LM, 877LM keypad, 893MAX, and 877MAX keypad. Now, it is time to give our verdict on the best LiftMaster garage door opener. To start, I must say that all these garage door openers are awesome, just like all other LiftMaster garage solutions. But then, there has to be the ultimate choice between them. But here is a disclaimer before we disclose our choice for the best LiftMaster garage door opener. The editor’s choice may be subjective and may not meet all your needs; this is regarding features, performance, and cost. That said, you can always have a change of heart and buy a different LiftMaster model. LiftMaster 8550 takes the slot for the best LiftMaster garage door opener. I like this model because it will work with most ceilings and offers very smooth operation. It is also powerful; it packs a 0.75 HP motor that delivers power to move even large doors while MVIS ensure minimal disturbance in the room above your garage. It also comes with a battery backup and a Timer-to-Close function. But above all, the price is fair, and this is actually what makes it the winner. Otherwise, LiftMaster 8500 would have been the best as it has a bigger motor and battery backup as well. The only problem is that it requires more maintenance and costs almost $100 more than LiftMaster 8550. Even though LiftMaster has been painted as the best garage door openers, they are not invincible. Time and again, you will encounter problems with your LiftMaster; from minor issues that can be easily solved to severe failures that will require part replacement. In this section, we look at the common hiccups you will find when using your garage door opener and the possible solutions. This points to a fault with the wall switch itself and may require the wall switch replacement or minor repair. But how do you tell whether it is the wall switch needed or just the switch wires? Unscrew the switch from the wall entirely and complete the circuit with your finger. If the door opens and closes, then it’s your switch that needs replacement, but if it doesn’t, then it is your wires that need replacement. A new switch should cost you around $15 – $20 while wire replacement is not a big deal as long as you an 18 – 22 gauge wire. In this case, it is the remote that has a problem, and there are two possible explanations. First, the batteries may be dead so replace and try it out. If this doesn’t work, I’m afraid you will need to get a new remote. While remotes could be repaired, just getting a new one will save you the expensive repair costs and besides, coming back to life maybe 50/50. This is another common problem with LiftMaster garage door openers. If it manifests these symptoms, the question must be with the sensors; either they need alignment or replacement. So how do you tell the problem between the two? The first thing to do is making sure the small sensors are correctly aligned. They should face up, and a low light should be illuminating. If you can see the illumination, the sensors are okay so make sure they are aligned and away from sunshine. If there is no light at all, then you need to get a replacement. This sounds like a big issue, and there could be two possible explanation; no power or the circuit board is dead. The first thing you want to do when you encounter such a situation is to make sure there is power in the mains. It will look stupid when you call in a professional to check it out only to find there is no power reaching the head unit. If you are sure there is power and no response is forthcoming, then your circuit board is probably dead and would require replacement. It will be unfortunate if the circuit board dies as it is quite expensive and would cost you an upwards of $80. If you live in areas with frequent lightning, consider getting a surge protector and shield your garage door opener from being struck. Sometimes, you may wake up only to find your garage lights not working. But when you open or close the door, everything seems fine. Here, there are two likely culprits; dead lamps, or a spoilt light socket. So, the elephant in the room is differentiating the two. If your unit has two lighting kits, make sure that they are all in order as they may get burnt out sometimes. But then, the major problem should be the socket, and it may need replacement too. Fortunately, they are cheaper but then require some DIY skills to replace them. This is a more mechanical problem and is common in garage door openers that are not well maintained, or serviced regularly. Typically, we advise garage owners to get a new trolley cartridge. Repairing the existing one may prove futile in the long run as the problem will undoubtedly persist. A new trolley cartridge should cost you an average of $30. When you hear a cracking sound, the same noise emitted when starting or stopping but the door remains static, then the problem is your drive gear. This is a plastic gear that is in contact with the worm drive gear. Honestly, this is the most challenging repair if you’d ask me. A replacement will cost you around $50 and will need a careful guy to do the repairs. As you have seen, LiftMaster is indeed a top garage door opener brand. These three are not the only options available; LiftMaster has several other models to choose from. But then, the most important thing is to make sure you buy the right type and size. I hope this comparison review has given you enough information to do that. So, if your garage door has been giving you sleepless nights; whether regarding security or convenience, LiftMaster has got you covered. That said, we have come to the end of this LiftMaster 8355 vs. 8550 vs. 8500 comparison review. So until next time, bye! Don’t forget to leave your thoughts, questions, and opinion in the comments section below!